Harambe is all around us. He’s in our streets and our timelines. He’s in the news and haunting the gallery at the PGA tournament. If there’s one thing I know about Harambe, it’s that you might not be able to see him, but he is there, watching over us and being shoehorned into Twitter threads by aspiring homecoming kings. Because the Harambening (like The Happening but furrier) has swept over a nation and cannot be taken back now. 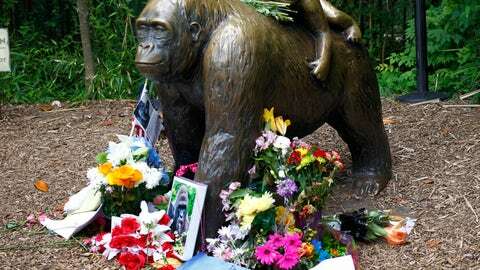 Since his controversial death at the Cincinnati Zoo in May, the 17-year-old Western lowland gorilla has become a pop culture monolith—the subject of countless jokes and memes and think pieces in response to said jokes and memes. Whether you like it or not, Harambe has infiltrated seemingly every cranny of popular culture — sports in particular. The following is an anthropological dig into the intersection of sports and Harambe, and how fans and athletes alike have adopted his memory and memes as their own. Because the world is tragic, but it’s never not weird enough to make up for it. With any momentous worldly occasion, the Pope is always one of the first to weigh in. Keeping with this tradition, WFAN’s Mike Francesa broke from routine back in May to give listeners a special, eight-minute sermon about Harambe’s passing and "you people" out there defending the primate. "You’re telling me you’re worried about the gorilla’s welfare?!!" Francesa shouted. "What is wrong with you??" On-brand and from the heart. Shock turned to sadness, and sadness into memes, and soon Harambe was being used as a punchline. Pittsburgh Steelers linebacker Vince Williams is credited with being the earliest known athlete to have employed Harambe for pettiness, tweeting a now-deleted jab at the Cincinnati Bengals on July 1 about the gorilla being in a better place now. "What if I told you it was a setup?" By late June, Harambe memes had become a cottage industry and an Internet currency worth their weight in beryllium. From here, Harambe memes did what only the strongest and most fearless products of online boredom are capable of doing, and made the Bane-leap from the depths of the Internet to the real world. By July, the Internet itself could no longer contain Harambe, and he began showing up at sporting events in different forms. Whatever form he takes, it’s not a question of "if" Harambe signs will be at sporting events you attend this fall, it will be a question of "How many?" and "Why are the athletes holding them?" Because athletes are people, and they’ve embraced the meme as hard as any. Athletes across all types and levels of sport have been likewise swept up in the Harambening. Philadelphia 76ers center Joel Embiid has invoked the gorilla to bond with new teammate Ben Simmons. Above all others, however, is Boston College quarterback Patrick Towles, who dedicated his 2016 season with the Eagles to Harambe — "the realest there ever was." The craziest thing about all this? It’s only just beginning. Where Harambe goes from here seems all fated, and we can get a good idea of its trajectory by looking at its closest approximation in sports/pop culture: Crying Jordan. Fight the meme-storm, or ride the lightning. Either way, he’ll be there — at the stadium and on your browser. Because if there’s two things the Internet doesn’t let die, it’s heroes and jokes, and Harambe has the unique distinction of being both. Dan is on Twitter. With Harambe as his co-pilot.